A very tough, robust, water resistant 2 door locker. Ideal for wet-area changing rooms and outdoor storage, will not rust or corrode. Two options available; "Shower Duty" (compartments will with-stand water spray) and "Storm Duty" (compartments will with-stand water). Recent statistics show that 98% of all basements will experience a certain type of water damage during their lifespan. The same source reveals that 37% of homeowner claim to have suffered financial losses triggered by water damage. The same threat can stop or slow down your daily operations, putting the profitability of your business on the line. Fortunately, now you can eliminate this risk in an effective manner, by simply buying and installing the premium water resistant plastic lockers brought to you by The Workplace Depot. What Is the Purpose of Water Resistant Plastic Lockers? 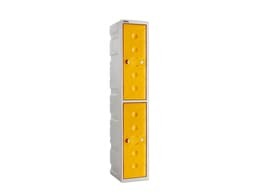 These lockers are designed to help you store and protect your goods even in the riskiest water damage-prone areas. 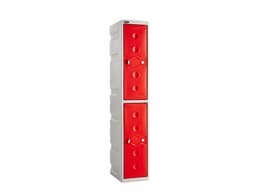 Due to their versatile design and quality materials, these bestselling items can help you organise and secure your goods indoors and outdoors, safely and conveniently. The shower duty model can withstand water spray, while the storm duty model features multiple compartments that can withstand a larger amount of water. Due to its safety and security features, modern water-proof design and incredible durability, this product is suitable for several applications and environments, including outdoor areas and wet-area changing rooms. Given its tough, water-resistant construction, these lockers won’t corrode or rust, even if they are exposed to water and elevated humidity levels on a regular basis. This product was designed to address the needs of workers and homeowners in need of durable, cost-effective storage solutions that are compatible with wet and damp environments. Given that these products are highly UV resistant and come with additional features geared toward a more efficient protection of the stored contents, the water resistant plastic lockers that we provide are a safe bet of households and businesses that want to keep water damage risks at bay. Made from MDPE plastic, these items are a fantastic option for clients looking for sturdy lockers manufactured using recycled materials. The models that we provide come with water resistant camclocks with hasp and staple or two keys. The storm duty models feature neoprene internal door seals while the shower duty lockers feature drain plugs that facilitate a rapid drainage after a wash-down. All items come in an ideal standard dimension-1800(H) x 325(W)x 450(D) (mm), which makes them easy to install, move around and stack, if needed. Featuring a grey metal body, our water resistant plastic lockers come with doors painted in one of the following colours: blue, grey, orange and red. Choose the model that you like best, in terms of features, configuration (2, 3 or 4 doors) and design, buy it with a few clicks and profit from a 10 year warranty on labour and parts and free shipping.